What In the World (Musikladen, 1978). What In the World (live, 1978). What In the World (rehearsal with Stevie Ray Vaughan, 1983). What In the World (live, 1983). What In the World (live, 1995). What In the World (live, 2002). “What In the World” was originally intended for The Idiot: it seems crafted for Iggy Pop’s voice (Pop’s audible on the track, especially on the second verse’s hollered “wait until the crowd goes!”), while its first line, “you’re just a little girl with grey eyes,” hints that the song is another in the Idiot‘s gallery of vulnerable, destructive women (“China Girl,” “Baby,” “Tiny Girls”). But suddenly we’re in stranger territory. Bowie breaks off the seduction, veering into harsh, bizarre commands (“never mind—say something! wait until the crowd cries!”); there’s a shift in perspective, so the singer could just as easily be shouting down the mirror (the song originally was titled “Isolation”). A chorus appears, or more like a string of half-assembled choruses looped together. Bowie’s tone lurches from sympathy to numbness, sometimes in the course of single line—he seems to be revising thoughts as he speaks them. So the rising melody in the chorus (“something deep inside of me”) runs aground against the title phrase, which Bowie sings flatly, drawing the blood out of the song. When he changes “you” to “I,” in the second chorus, it’s even more disruptive: the long, biting vowel sound hobbles the melody. “What in the World” is a series of rapid concussions: the first verse is over and done in 15 seconds, the first chorus in 20, and if not for its lengthy (by Low Side A standards) outro the song would run its course in a minute and a half. Yet “World” doesn’t feel brief, but seems to deepen and expand as it proceeds, disclosing new surfaces each time it’s played. Tony Visconti’s mix is as wearying to listen to as it’s invigorating—nothing is foregrounded, nothing is central, everyone seems to be fighting for space. (There’s a taste of Sparks in all this—Visconti had produced their Indiscretion the year before). As with most of the Low tracks, there’s the sense Bowie’s vocal just as easily could have been wiped. The players zoom in and out of focus. There’s Ricky Gardiner’s jittery lead guitar, its brittle sound in part owed to Gardiner playing through a small, tinny Fender amp—he hadn’t wanted to bring his expensive amp on the plane. He gets a four-bar guitar solo, but then continues on in the left channel, as if unaware that another verse has started. Carlos Alomar’s rhythm guitar, dryly recorded and mixed low in the right channel, offers the song’s constantly-changing building blocks (each bar of the verse shifts from F to E-flat, while the chorus is a series of shifts, stabilizing on eight bars of stepwise back-and-forths from D to C.) Dennis Davis’ crashing, Harmonized drums are as much a lead presence as Bowie’s vocal (“World” is the second of three sequenced tracks on Low that a Davis drum fill kicks off) while George Murray’s steady bass playing makes him seem like the only sane man in the room. Roy Young’s Farfisa organ shows up in the second chorus, like a late party guest, while Brian Eno plays the joker in the pack, his regular role on Low—here Eno’s EMS Synthi One suitcase synthesizer churns out bubbling noises that saturate the first verse and seem intended to throw off any sense of rhythmic stability. Low is also, as we’ll see, a record of Bowie grappling with writer’s block, to the point where getting a single line down was painful, and in “World” Bowie’s typically short and uncluttered lyric seems pieced together out of older songs: “I’m In the Mood For Love,” the Doors’ “You’re Lost Little Girl,” Syd Barrett’s (covering James Joyce)”Golden Hair” (possibly the inspiration for “talking through the gloom”), the Who’s “The Real Me,” the Yardbirds’ “For Your Love.” In the latter song, Keith Relf sang the title phrase with an emphasis on the last word, the previous two used as propulsion to launch the last into the air (“foryour LOVE!”). In “World,” Bowie places equal weight on each word, as if he’s singing phonetically and has no idea, or no care, what relevance each word has: “FOR–YOUR–LOVE”. “World” is love song as interrogation, an isolate’s attempt to connect with another isolate (the girl’s “deep in your room” here, Bowie’s stuck in his room in the following song, “Sound and Vision”): it gives the listener as little concession as its singer gives the girl with grey eyes, who very well may not exist at all. Recorded September 1976, primarily at Château d’Hérouville. The song must have wronged Bowie in some way, as he gave it a reggae arrangement on stage in 1978 and 1983. Revived in later tours. 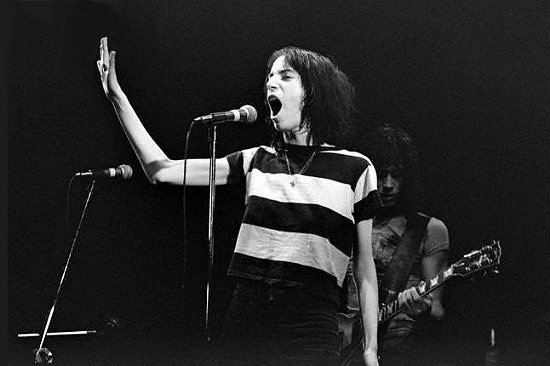 Top: Patti Smith at the Boarding House, San Francisco, 1976. This entry was posted on Monday, February 7th, 2011 at 10:42 am and is filed under Low: 1977. You can follow any responses to this entry through the RSS 2.0 feed. Both comments and pings are currently closed. There’s a lot of instances of Bowie (and a lot of his more far-out peers, too, I guess especially and pertinently Eno) using that tried-and-true “using words that sound good as sounds rather than words” approach. But I feel like on Low, Bowie goes a step farther and really seals the deal on sounding like he doesn’t know what the words he’s using mean, like you said above on the “FOR-YOUR-LOVE” line. There’s great examples of it all over, he kind of sounds like he’s asking a question with his word choice— but he doesn’t really care what the answer is. Yeah, I’m totally stoked for the Low posts. Low as the writer’s-block-album works well, and I think points to a crucial Bowie dynamic. There was a brief period in the early seventies when the songs seemed to spill out of him, but I’d say the writer’s block syndrome kicked in as early as Young Americans. The rapid stylistic turnabouts are at least in part motivated by a need to come up with more material, a kind of crutch to lean on in the songwriting process. By Station To Station he was stretched thin, pulling disparate fragments together to form the epic title track, stretching out a single riff into a song in Stay, etc. And with the Berlin albums the writer’s block is somehow subverted through the focus on process. But as early as Lodger we get a glimpse of the disappointing strategy of the eighties, recycling old Iggy Pop material, with Red Money (which I actually love). Yeah, I agree there’s a sort of “little ice age” in DB’s songwriting that goes from ’75 to ca. the early ’90s (and he could be in another drought now, hence his ongoing silence), but there’s also the brutal pace of pop recording in the ’70s as a factor—everyone, from the Stones on down, was still expected to put out a record a year, regardless of their mental state and touring schedule. & so what DB does to combat this drought is what, for me, makes his work interesting for much of this period—of course, Tin Machine lies at the end of these efforts (no premature judgments here—i’m going to attempt to take on Tin Machine with an open mind). Agreed, what Bowie does to counter writer’s block is both interesting and artistically satisfying from 75 to 80 (and less so in the ensuing lost decade, but I’ll be interested to see what you have to say about that). Another factor in the “writer’s block” could be the presence (or absence) of talented collaborators who are strong writers on their own. So after Ronson leaves or is kicked out, Bowie seems to struggle; Alomar and Lennon help a little, then Iggy helps. After the Iggy projects, Bowie seems to be pretty much alone. I’m reminded of an interview with Pete Townshend, in which he said he felt a kinship with Ray Davies, and felt that they (The Who and the Kinks) could never be as big as the Beatles or Stones simply because as far as the writing chores went, Pete and Ray were pretty much all alone, whereas the Stones and Beatles had two or more top writers in the group. I don’t know, I think the Alomar/Davis/Murray trinity was a great foil. It sort of seems like DB comes to town with some chord progressions, a melody or two, and little more than a shell, and Alomar and the dudes take those and make either a really solid Jam that Bowie can do whatever he wants over, or they make a more put-together song. What I mean to say is, I love giving Alomar as much credit as people give Ronson. Regarding the inference that Sparks might have influenced a crowded mix on this song: I personally think that Visconti’s production on Indiscreet gave that band one of the most balanced, *listenable* albums they ever had. Indiscreet is a lovely thing to listen to on headphones – every instrument seems to stand on its own. It’s beautifully engineered and mixed – not to mention the great Visconti arrangements on multiple songs. It’s a great record; it’s a shame they never worked together again. You may be thinking of Kimono My House, which is a very dense production, indeed – but awesome to listen to at full volume. It’s massive. I love this blog. I’m actually reading through it again, backwards – and I caught the Sparks comment. This is the finest writing on Bowie that I’ve ever encountered; I’m gonna be all over this book when it comes out. I think the Stage versions of this song (and Breaking glass) are much much better than the original(s). They are among my last headaches of the poll. The live versions are dancing on the verge of top30. Not my idea, but I slapped my forehead when I read it: It’s such bleeding obvious pop psych that it makes perfect sense. This is a song to the anima. She’s in hiding and he’s trying to coax her out. A little girl with grey eyes who won’t come out of her room. He needs her to give his work and live performance depth of emotion, but she won’t bend to his will: “Never mind, say something/Wait until the crowd cries”. “Something deep inside of me/Yearning deep inside of me/Talking through the gloom”…”Ah, what you going to be?/To the real me”. His mind is dark and his emotions are numb, but he can sense she’s still there. He just doesn’t know which role she’ll play in his reconstructed self yet. Can’t see it any other way now. Also I love the pinball bleeps on this track, the phrenetic, stumbling beat and shouty Iggy in the background. It feels like a mad night at the arcade, bantering nonsense about that turns into a song.